Debenhams started from a single London store selling drapes in 1778, then called ‘Clark’s’. William Debenham joined as a partner in 1813. The store traded successfully and eventually renamed as Debenhams Limited in 1905. Debenhams expanded by opening new stores and acquiring other famous department store groups, including Browns of Chester. At one point Debenhams owned Harvey Nichol’s famous Knightsbridge store. There are 178 Debenhams stores in the UK and Ireland, and several franchised Debenhams units overseas. Whilst many department stores have recently fallen out of favour, Debenhams continues to succeed through its own mix of designer brands and exclusive designers available only through their stores. Click here to find your nearest Debenhams store. Where can I check my Debenhams gift card balance? 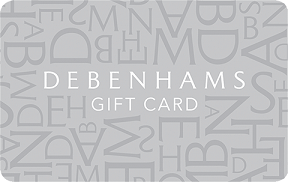 You can also check your giftcard balance at any Debenhams store in the UK, simply hand over the card at any till point and a staff member can obtain the balance for you. Where can I spend my Debenhams gift card? You can spend a Debenhams gift card at any Debenhams UK store, and also online at their website. Does a Debenhams gift card expire? If the card is not used for a purchase, top-up or balance enquiry for a period of 24 months, it will be cancelled and any value on that card will be lost. Where can I buy a Debenhams gift card? Debenhams gift cards are available at all Debenhams stores, supermarkets including Sainsbury’s and some petrol stations, including Shell. You can buy a Debenhams card to be sent to your home address via the Debenhams gift card website here. If you want to send your Debenhams gift card to someone else as a gift, they have a separate web site for this here. Debenhams have a separate gift card site for making personalised plastic gift cards – you can have your own photo or message printed on the card and sent as a gift – what a cool idea! This is particularly well suited to birthday and wedding gifts, and they don’t charge any more to personalise the cards (prices last checked April 2017). This is a particularly cool feature and we’re sure other retailers will be copying it before long. Have a look at their personalised gift card site here.